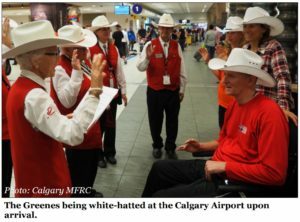 This year, the guest of honour for this fund raising event for the Calgary Military Family Resource Centre, was Capt (ret'd) Trevor Greene. Greene made headlines in 2006 after he was attacked with an axe by an Afghan youth during his deployment in Kandahar Province with the Patricia's. He wasn't expected to survive the massive head wound, but since then has accomplished great things. A contribution from the PPCLI Foundation helped bring Trevor and his family to Calgary. Experienced entrepreneur building technology startups and media companies in the USA, Canada and Japan. Product marketing expertise framing opportunities and trends for new technologies.